The innovators who have propelled jazz forward over the last century have always balanced a deep respect for the music’s history with a fierce drive to move jazz forward. These dual commitments sit at the heart of the new Walker-commissioned collaboration between iconic jazz guitar innovator Bill Frisell and Twin Cities–rooted power trio the Bad Plus, featuring Dave King (drums), Reid Anderson (bass) and Ethan Iverson (piano). The new project, comprised of two performances on September 29, both looks back at and reimagines, through the distinct sound of the Bad Plus, a set of important early Frisell compositions released between 1985 and 1995. Frisell’s history with the Walker predates even those years. Frisell first appeared at the Walker in 1981 as a member of Jan Garbarek’s quintet. But soon thereafter former Walker music programmer Chuck Helm began booking Frisell as a leader regularly as well as in other notable bands spurring a decades-long relationship with the Walker that continues today. Helm continued to champion Frisell’s work for the past 27 years in his role as Director of Performing Arts at the Wexner Center for the Arts, while the Walker, under Performing Arts Senior Curator Philip Bither (who presented Frisell in New York and Vermont in the 1980s and ’90s) has repeatedly hosted and commissioned Frisell. Chuck Helm: When did you first cross paths with the guys from the Bad Plus? 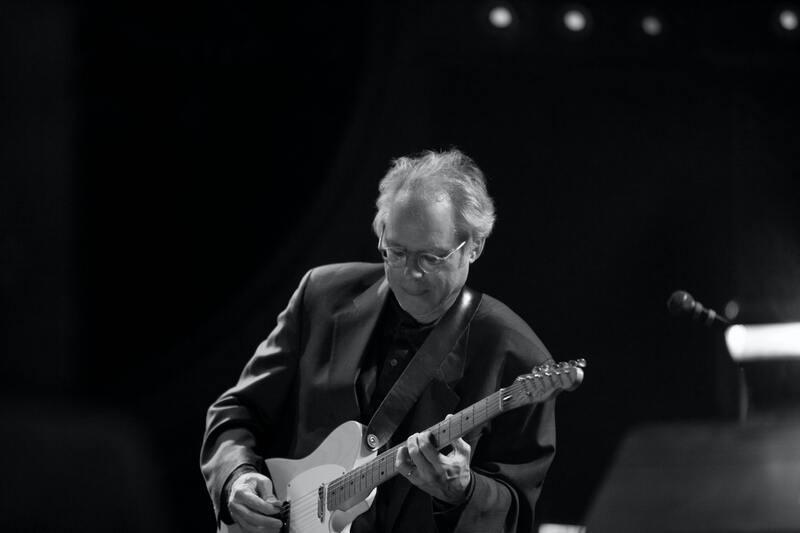 Bill Frisell: I became a fan before I had ever met them in person. I think the first time I heard them play was at this place called the Tractor Tavern in Seattle. That’s when we met, and I think I was surprised to know that they knew who I was. It was sort of a shock to learn that they had heard me play years before at the Walker. Helm: I think they were still in high school when they started to come to the Walker to see shows, including all the shows that you played there back in those days. Frisell: Yeah, that’s what they said. So it was pretty instantaneous connection. Whenever they came to Seattle, I’d usually see them. Or I’d see them at the Vanguard. We had so many mutual connections and friends. You know, Ethan started playing some gigs with Paul Motian. Helm: When you played with the Bad Plus at the Newport Festival in 2012, that was a sort of tribute to Paul, right? Helm: The set was mostly Paul’s music, including a version Paul had done of Hank Williams’s “I’m So Lonesome I Could Cry,” which must have been a really emotional experience… So, the Walker concert is the first time that you’ve collaborated with them plus doing your music, is that correct? Helm: What did you think of this proposal to concentrate on the decade of 1985 to 1995 of your music? Frisell: It brought up a lot of memories. As I’m getting older, it’s not really linear, the way time moves. It’s like this weird rubber band or something. Every once in a while, it’ll just snap and you’re suddenly in some other period… It was Dave who I first talked to about the idea. I had that feeling like, “Whoa, wait a minute. What just happened?” Here I am and they’re talking about music that I wrote 30 years ago. I don’t keep up with my own self very well. Helm: You are a really prolific artist with so many different projects all the time, so what’s it like to go back and revisit that era? Frisell: It’s weird because I never listen to my own albums. As soon as I do them, they’re pretty much gone. They’re out of my mind. When you think of however many albums I’ve made, dozens of albums, and a lot of that music I never even played live before, and then there’s stuff that I played live 30 years ago that I haven’t thought about for a long time. Lately, I’ve been going back and looking at some of my own stuff and it’s a—I don’t know what the right word is… revelation? Well, not a revelation, but that does happen with other tunes that I know. Like a song like “Body and Soul” or a [Thelonious] Monk song or a standard song. As the years go by, I’ll look at it and I’ll see new things in it that I haven’t seen before. That’s the way music works. I never experienced that with my own music, though, so now looking back at some of the things they were talking about, I’m seeing them through this completely different lens. I don’t know if I was in a more naïve state then, but there are things that I perceive or understand in a different way now. It’s an amazing thing, actually. Helm: As a composer, you’ve always been interested in writing for an ensemble rather than setting up a situation where it’s all like, “Let’s play a theme and then everybody riff off of that.” Back in that era, that decade of ’85 to ’95, you were really developing that voice as a composer for ensemble. A lot of it was around that early classic quartet of you, Hank Roberts (who you’re playing with now), Kermit [Driscoll], and Joey Baron on drums. In that period, you were really coalescing that compositional voice for ensemble writing, and I think that ensemble approach in many ways lends itself to a project like this, where now different musicians and different instrumental voices can come around these tunes because it’s open to that. Frisell: That’s definitely it. Back then, that was my first group with Joey and Kermit and Hank, my first real band. That was where I really started to write music. I remember at the time it was so connected to those people. It was almost like I didn’t know if I could write for anybody else. Everything that we did was so much a part of those personalities. Those were the guys that also gave me confidence to bring a tune to somebody. It was real easy for me to get discouraged with my own writing if people didn’t take an interest in it. Those guys did. They urged me on, to keep going with it. When that band came to an end, it was kind of traumatic for me because I didn’t know: “Wow, I wonder if I can even still write music for other people.” I didn’t even know if it would work with other people. Somehow it did. Helm: That decade, too, there was a lot of musical transformation because as you were coalescing your ideas about writing for that quartet, you were also juggling being active with John Zorn’s Naked City and starting your playing relationship with Paul Motian and Joe Lovano. As with a lot of that music, Paul always had this interest in standards and his own repertoire, his own compositions. And Zorn was constantly hyper-accelerating a million ideas a minute. The kind of virtuosos that you and those other musicians were, you could have a command of all these various genres and jump cut from one to the other and shuffle them around for Zorn’s compositions. And then also during this time is when you were deciding to leave New York and eventually move to Seattle. Helm: I know part of that was that you wanted a place where you felt you could raise kids and be away from the intensity of and the expanse of New York City. For a while, Minneapolis was in the running for one of your choices to move to with Seattle. And then I booked you guys for a show in January. Frisell: You should never have done that. Helm: Yeah, it’s a cautionary tale. Frisell: I still remember. I can still see you with that Arctic, whatever that thing was you were wearing. Helm: I picked you guys up at the airport wearing an Air Force Arctic-grade flight suit. Frisell: It was unbelievable. That was the most intense cold. I remember you could barely get from the car to the door without risk of death. Helm: There was a lot going on then, but I think that the work you were doing in that decade with that quartet was really centered on what you were doing as a composer and as a player—which is what the guys from the Bad Plus saw at many of those shows you did. Frisell: Correct. The Walker, with you—so many first time things happened there for me. That was really one. Helm: —as well as larger ensemble pieces and various other projects over the years. The Wexner commissioned The Great Flood project with you and Bill Morrison, both organizations teamed up to co-commission your Disfarmer project in 2007, and now you’re doing this collaboration with the Bad Plus that the Walker’s commissioning. It will also be performed at the Wexner Center, as well as at the University of Illinois and in New York. What’s that been like to know a place like the Walker or the Wexner Center will offer this type of longstanding commitment? It’s been 30 years that this has been going on. Frisell: That’s a heavy question. The way the world is, I just can’t even imagine where my music would be, you know? There are opportunities that happened for me there. Maybe they would have happened somewhere else, I don’t know. It’s rare. Really, some of the very first of my own gigs happened there. Or even ideas from you. The first time I ever heard Jimmy Bryant and Speedy West was you giving me a cassette tape of that stuff, right? Helm: I think it took eight years after we first started talking about it to pull that [Disfarmer album] together. Frisell: And then it just kept going, how I ended traveling to that place and meeting people and writing music. It’s amazing. Helm: One of the most mind-blowing things about this collaboration you’re doing with the Bad Plus is just the idea that Ethan and Reid and Dave were really young guys in the audience from this community, and the Walker was the place that they were going to hear this music live. I believe they actually met each other in the lobby in the Walker after the shows and were talking about it and decided, “Hey, we want to be a band; we can do this right now.” Thirty-something years later, they just had the idea, “Well, one of the touchstones was Bill Frisell’s music. Wouldn’t it be great to play that music with Bill at the Walker?” It’s pretty amazing thing. It’s very special for all you guys. Helm: What are a few of the tunes the audience will hear? Frisell: I’m not sure. Dave sent me this huge list—from my very first albums through up into the nineties. There’s a lot of stuff. I was like, “Oh, my god.” Luckily, I have all the written music stashed away somewhere, so I dug all that up. Some of it I’m like, “Wow, how did I even play this?” I have to really do some homework to get it together. There is this thing about looking back: I keep finding things that I didn’t realize at the time, things I didn’t fully understand or I didn’t learn. I keep seeing more in things in the past that I didn’t see the first time. There’s that, but then my hope is that it helps me go into the future. What’s exciting about this is not trying to recreate something that I did before. It’s a chance to look at what’s there, and hopefully it’ll point some way into the future, or I can find something new within this stuff. You’re looking both ways at the same time. When I hear somebody like Louis Armstrong or Robert Johnson or somebody we take for granted as some sort of historical, mega, gigantic, monolithic historical figure—Duke Ellington, or something—and I try to listen to that to get into the head space, try to remove all associations I have with it, and try to imagine hearing that for the very first time, I just realize how radical it was or how avant-garde it was. Imagine 1920-something and you walk into a bar and there’s Louis Armstrong playing. It would be the oddest thing you ever heard in your entire life. It would be so mind-blowing, but at the same time what he was doing was so accessible. It was this combination of something so beautiful that no one could resist it, but it was also as if something dropped in from another planet, a sound that we’ve never even heard before. I like to think about that kind of stuff. Helm: Well, I know everybody is looking forward to hearing what you and the guys from Bad Plus are going to do together, Bill. It’ll be coming up here real soon, so we’ll see you then. Frisell: Yeah, it is coming quick. I can’t believe it. I better practice. Oh, my god.